Office space prices ranging from $450 - $678 per month. Brand new modern unfurnished offices with up to three brand new workstations in each with large lockable caddy. Situated on the waterfront at the intersection of Bermuda Street and Lake Orr Drive, just 15 minutes from Gold Coast Airport. 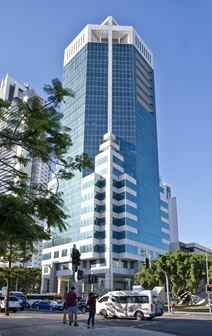 Situated on the Gold Coast, this prestigious address is in the heart of Surfers Paradise. With great views, this centre offers furnished office accommodation and is just minutes from a great range of cafes, restaurants and more. The space comes fully equipped and clients of the space benefit from a wide range of business support facilities and amenities, including meeting rooms, board rooms and reception services. 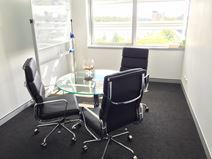 Fully furnished serviced offices are available in this stylish modern business centre, with views over the river. This prestigious business address is conveniently located, close to coffee shop and restaurants. The leading Serviced Office provider located in the prestigious Corporate Centre building in Bundall. Magnificent views of the Gold Coast and hinterland from our fully furnished executive offices. Ample parking, state of the art technology a full range of secretarial and professional services are also available in this unique corporate environment. Close to 3 major shopping centres, public transport including train and bus. Gold Coast Convention Centre only a few kilometres away. One of a kind work space located in the famous city; Gold Coast. The center boasts some of the best views in the Gold Coast with 360-degree views of the Ocean, Surfers Paradise and the Gold Coast Hinterland. This center's positioning makes it an ideal place to host any type of business whether it be start-ups or freelances, big or small. The center is in the Corporate Center Complex in Bundall. Bundall is in the very center of the Gold Coast with easy access out to the freeways and a 25-minute drive to the Gold Coast Airport. Offering a wide variety of car parking got permanent staff and visitors. The complex host multiple cafes and a gym, health club and swimming pool. Find yourself with plenty of office choices at this fully serviced office centre. All offices come fully furnished and are equipped with plug-and-play solutions so all you need is your team and hardware. With all inclusive prices, that include complimentary tea and coffee, wifi, and printing facilities this centre allows you to get down to business. Easily accessible by bus or car with free parking onsite, and with facilities nearby, your commute couldn't be less stressful and your work life more balanced. 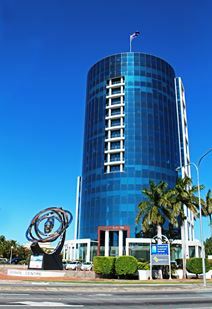 This is an ultra-modern building with underground parking offering state-of-the-art facilities with serviced offices. All offices in this space are furnished to an executive level. Free use of boardrooms and meeting rooms. Access to Brisbane office and others nationwide. Situated next to a beautiful lake, there is easy access to Bond University, Robina Town Centre, Surfers Paradise and the SE Freeway to Brisbane. The centre provides a variety of office spaces. The centre provides high speed internet, kitchen facilities, meeting rooms, printing station, private phone booths, concierge services, bike storage and storage lockers for your daily office use. The centre is in Varsity Lakes. You can easily go to the centre by bus (Varsity Pde near Main Street or Varsity Pde at Assembly Drive).It is just three minutes walking distance to the bus station.